A.M. Cannon Aquatic Center in Spokane's West Central neighborhood. Heading to the pool to cool off this summer won't cost you a dime, thanks to a newly approved measure by the Spokane Park Board. City leaders hope this move will reduce barriers of access to the pools' open swim times, and will increase attendance, especially at the aquatic facilities it considers underutilized (Liberty, Cannon and Hillyard). Last year's operating cost for all six centers was just over $1 million, and revenue from admissions ($2 for children and $4 for adults per visit) came in under $200,000, which the city considers a small gap to cover in exchange to offer residents free swimming. Funding for this year's pool operations will come from previous years' annual reserve excess. From this year forward, free swimming will become part of the annual parks budget. In addition to open swim times, the measure also includes free access to parent-tot time, a calm and exclusive swim time in the pools' wading area. Lap swimming and family nights are also included. Swim lessons offered through the parks department, along with novice swim team and aquatic fitness programs, will continue to be offered for a modest sign-up fee. 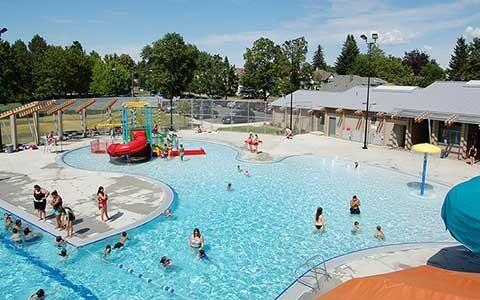 In past years, a number of community groups sponsored free swim days at Spokane's public pools, and park leaders now hope those funds can be redirected to free swim lessons or other aquatics programs. No change will be made to the number of lifeguards on duty at the city-run aquatic centers. Anyone who has already purchased a 2018 season pass to the pools will be refunded.